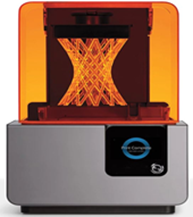 For 2019 we have added to our capability with the latest generation of Formlabs’ 3D stereo lithography (SLA) printing technology to capture advances in capability and to expand the print scale and range of materials we can use. This investment is already enabling more intricate detail, giving high dimensional accuracy to a tolerance of only 25 microns and providing stunning surface finish in a variety of materials with more detail than other plastic 3D printing technologies. Unlike printers that use infill to alter the amount of filament that is being used inside the solid parts of the print, SLA printers print a solid resin that hardens when exposed to ultraviolet light, and this ultimately makes the models stronger. We got started in 3d printing technology way back in 2012 with the acquisition of our first ‘traditional’ fused filament modelling (FFM) printer which gave us the ability to print solid parts in a range of colours and with tolerances of 0.2mm (200 microns) primarily in ABS in sizes up to a 10cm cube. The ability to create rapid prototypes in a matter of hours has proved very useful as a part of our design evaluation process. Both technologies utilise the power of our CAD software to enable relatively low cost prototyping and to ensure that every detail is correct. We offer 3d printing as a commercial service to enable customers to see 'real' rapid samples as part of the design and development process before committing to injection mould tooling. The possibilities are endless.